What is the most complete workout for huge arms? The arm is one of the most visible body parts. This week's question focuses on a complete arm workout that includes the wrist, forearm, biceps and triceps. Try it now. The arm is one of the most visible body parts. This week's question will focus on a complete arm workout that includes the wrist, forearm, biceps and triceps. What is the most complete workout for huge arms? Be specific. Include exercises, sets, reps, etc. for the wrist, forearm, biceps and triceps. Would you split some of these up and incorporate with other body parts or would you keep them altogether in one session? Bonus Question: What bodybuilder has the most complete package in the arm department? What Is The Most Complete Workout For Huge Arms? While perhaps not the most functional of all muscles, having well-developed arms is the primary goal of many lifters, particularly casual ones. Obviously, visibility plays a large role in this, and there are many ways to approach arm expansion. Gaining inches on one's arms isn't exactly rocket science, and many people make it more complicated than it has to be, probably due to poor understanding on their part. Doing 1000 push-ups per day or 500 curls with five pound weights isn't the way to go about it. In fact, performing too many exercises aimed only at the arms won't be effective. This is often referred to overtraining. I'm certainly not suggesting that being lazy is conducive to muscle growth, but lack of rest will interfere with desired results. What I would recommend is having a split that includes two full-body days, focusing on compound lifts, one day dedicated exclusively to arms, and a leg day in which exercises for wrists and forearms are included. In order to promote the most growth, I'm going to focus on two different rep ranges - low (4-6) and med-high (8-12). My reasoning for this is two-fold. First, I believe consistently training in the same way leads to stagnation. Second, both rep ranges emphasize different methods of gaining size, so using both rep ranges takes advantage of both methods. The low rep range induces greater output of testosterone and the expansion of muscle fibers. The high rep range produces higher levels of HGH as well as lactic acid, which gives your muscles a fuller look. In addition, I'd also recommend ending your session with some fascial stretching - a somewhat secret method that makes a big difference. Warm up with one or two lighter sets at 12 reps.
Click Here For A Printable Log Of soundcheck129's Arm Day Workout. Another method I like to include in the interest of hypertrophy is forced reps. 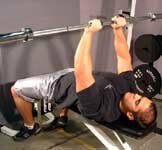 In a forced rep, one uses the assistance of a spotter to squeeze out a few extra reps, after "failure." This adds another layer of intensity and SHOULD NOT be used on every exercise. 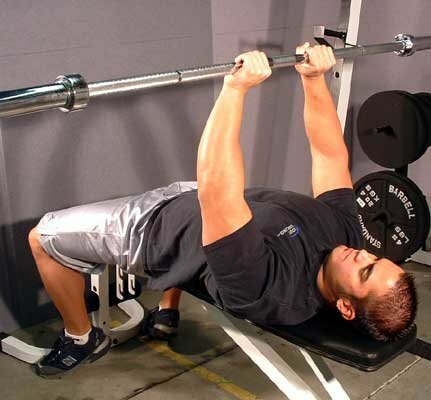 I like to warm up with the bench press and row because they include the triceps and biceps, respectively, as secondary muscles before you begin the direct onslaught with curls, pushdowns, extensions and close grip bench press. This provides a nice warm-up and I feel it's important to include exercises in which the biceps and triceps are working as synergists, rather than prime movers, to make a complete workout. Also, I find doing antagonistic supersets gives me a better pump, and it also saves on time. In order to maximize growth potential, end the session with fascial stretching. To perform this type of stretching, simply hold the 'bottom' of the negative repetition with the weight you were using last (or slightly lighter) for 20-30 seconds. The idea is that this will stretch out the fascial, the tough tissue that surrounds muscles, creating more room for growth. It has been said that this type of stretching was Arnold's "secret weapon." Click Here For A Printable Log Of soundcheck129's Wrist And Forearm Workout. The reverse curls are favorites of mine, you'll definitely feel the burn after those. I like to include the cable and palms-down curl to make sure I'm hitting the wrist and forearms from every angle; on the cable curl your palms will be up, and on the palms-down curl they will obviously be down. Again, after the session remember to perform fascial stretching, preferably for about 20-30 seconds on the "bottom" of each negative exercise you perform. Last, but certainly not least, is nutrition. If you want bigger arms, you're going to have to increase your caloric intake - make sure you are eating enough to cover the physical exertion from your workout, plus a surplus of around 500 calories for growth. Ample protein is a must, and that need can be easily met with protein powder. However, don't neglect carbohydrates and fats, as they are needed to fuel your workout. If you really have a problem eating enough, try a weight gainer. Would You Split Some Of These Up Or Would You Keep Them Altogether? As I mentioned earlier, I would split up these exercises, placing the biceps/triceps workout on a day of its own, and including the forearm and wrist exercises on leg day. This allows your arms to get the attention they require, but also provides ample time for rest, recovery, and most important of all, growth. Also, I believe splitting the exercises up allows you to produce the intensity needed to maximize results. You don't want to wear yourself out on a bunch of compound lifts and compromise your strength for later in the session. Incorporating forearm and wrist exercises on leg day will also help your legs recover while you concentrate on arms. What Bodybuilder Has The Best Package In The Arm Department? There are so many greats, but I'd have to go with Lee Priest. Bulging biceps, thick forearms and massive triceps, all on his 5-foot-4 frame. His arms are massive, yet he still managed to attain incredible definition. You can see nearly every vein running up and down his arms and he's got the classic horseshoe triceps, fit for a clydesdale. Pictures of Priest make it seem like his arms are ready to burst through the skin. When I go back to college in a week, I will hit up the weight room with excitement. I won't be the only one who will be hitting the weight room as many others will be in the weigh room trying to lose weight as a New Year's Resolution or in preparation of spring break. The thing is that I don't see people running on treadmills, but I see guys and girls doing curl after curl like its going to produce results. They do it day after day. Ladies and gentleman this is not the way to go when trying to train your arms. Arm training is of vast importance and many fail to understand the varied "right" ways to train it. My workout seeks to provide info on why I use the particular exercises as well as the particular reps.
Click Here For A Printable Log Of History in Effect's Triceps Workout. 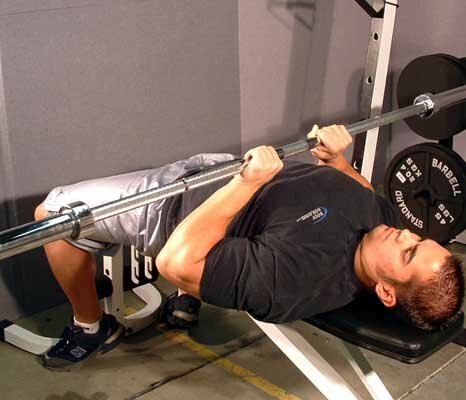 Close-Grip Bench Press - A big mass builder for the triceps. It will have your triceps frying and feeling warm inside. They build mass like no other. Dumbbell Overhead Triceps Extension - Your triceps in my opinion should always have one position over the head. It does not only feel like you stretching the muscle, but you feel it down the whole triceps head. Reverse Grip Cable Pressdown - Now it is time for my favorite triceps exercise. This exercise is magical not only because it is last, but you feel it like no other. If you want to that horseshoe on that triceps giddy up, then this is the exercise that will have the ladies or gents saying "wow." Reverse Grip Cable Triceps Pressdown. These exercises will get your biceps pumping. I work my triceps first because they are weaker than my biceps and many people only work curls. Triceps make up most of your arm, so people should be also concentrating on triceps to have the full package arm. Click Here For A Printable Log Of History in Effect's Biceps Workout. 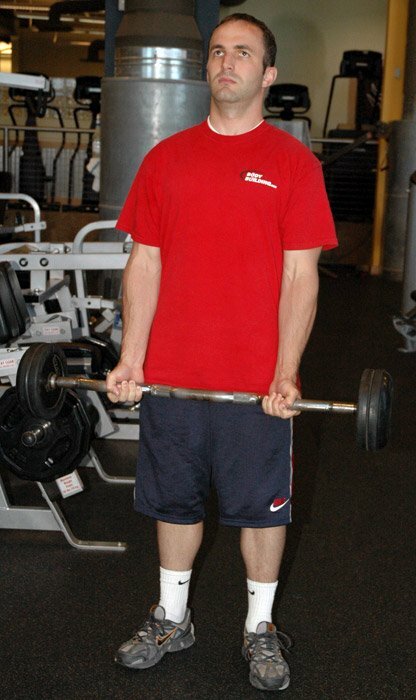 Barbells Curls - Barbells Curls is the first exercise off the bat that I use. The goal is to get bigger arms and thus I start off with barbells. Barbells Curls are known for building mass in your biceps and thus they should be first in your arsenal. The rep range is used because I personally felt strength and mass increases with a rep range between 6-10. It is the best of both worlds to get stronger and bigger. 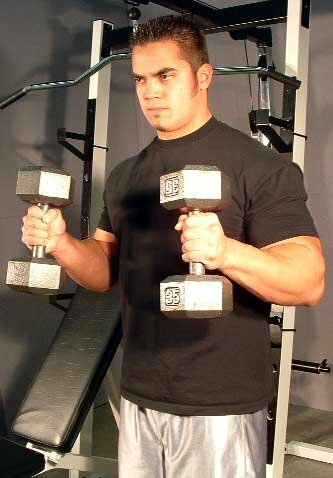 Alternating Dumbbell Curls - You should always include a dumbbell exercise because they activate stabilizer muscles that are not seen as prominently when you do barbells. Dumbbell Curls bring in detail into the arms and help target the muscle individually. Overhead Cable Curls - You can't have a biceps exercise without getting isolation. You get this isolation through the use of the overhead cable curls. Many people always talk about having the peaks on your biceps. Trust me you will fill this exercise right in the middle of your biceps and your arms will be burning. These exercises will you have you pumped and will be growing in no time. You just remember on every rep to squeeze at the top and have a clear mind when doing it. Going moderate and having the mental connection is better than going hard and lacking the mental capacity. If you do this, you will have the peak and a huge biceps. Now that you know how to train the upper arms, it is time to move down to the lower arms. When it is warms outside, the first thing people often see is your forearms/wrist area. You can't hide them like your biceps and they can be seen pretty noticeably. I am pretty sure you don't want to have bulging triceps and biceps while having puny forearms. It is time to train those bad-boys. Click Here For A Printable Log Of History In Effect's Forearms/Wrists Workout. Dumbbell Hammer Curl - It is time to get to work on forearms and hammer curls are the perfect start. These will build mass in your forearms and also your grip. Don't rush through hammer curls, but take your time and hammer out a good rep. 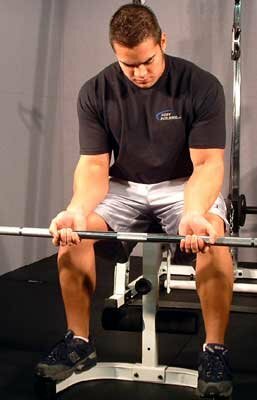 Reverse Wrist Curl - It builds the back of your wrist, thus it is named reverse wrist curls. You should not pile on the weight on this exercise or you will be aching for a while. Take your time and your forearms will be popping. Barbell Wrist Curl - Last, but not least this exercise can not be forgotten. You should use more weight on this exercise, but still concentrate fully to see great results. Forearms are important to lower arms as biceps and triceps are important to upper arms. Work them diligently and carefully concentrating on the lift. I work biceps and triceps on their own day, because they need to grow. I work triceps first because they are weakness and they need to be brought up for the full package arm look. Triceps make up the majority of your arm and thus you need to train them. Many people forget about triceps, but I urge you to not forget about it. I train forearms on a separate day than arms, because to work them after doing heavy arms will do no good and leads to possible injuries down the road. You don't want to be sore for the next day. I train forearms at least one time a week and two days at the most usually on cardio days. Ronnie Coleman's biceps are like huge water pipes that just want to bust out. Veins are huge and look like irrigation lines. Triceps are ripped to the bone and defined. Forearms are bulging and probably bigger than my upper arm. Ronnie Coleman was and is still a bodybuilding freak. He is amazing. His arms are crazy huge. The only person I see having a chance at coming close to him is Phil Heath. Ronnie is known for his biceps and Phil is now known for his triceps pose with his huge horseshoe muscles. I just know Big Ronnie Coleman is the man. It is true that the arms are the most visible body part that you have. Of all the body parts that you have, they are the ones that actually get shown off the most. Every day that you wear a short sleeve shirt you are putting your arms on display. With that in mind, even if you have 20-inch arms you most likely want to have 21-inch arms. However, with that said you might also want to consider that you want to have well defined arms as well, meaning a good horseshoe on your triceps as well as a good peak to your biceps. Having set those two criteria, for truly huge arms you will need to have two types of exercises, some for building pure mass and others for emphasizing specific details. 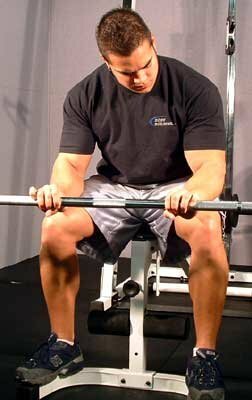 So if the focus of your lifting is to have truly great arms, you will want to start dedicating 2 days a week equally spaced apart to training them. One of these days will be focused on overall mass building, while the second day will be focused on details. Each day should take about an hour or so in the gym (approximately). On the first day you will want to push yourself with the heaviest weights you can for each of these exercises (while still maintaining good form). Click Here For A Printable Log Of g4owensj's Mass Building Workout. Click Here For A Printable Log Of g4owensj Detail Building Workout. You might have noticed that there are not a lot of forearm or wrist exercises, but this is due to the work they get while doing other exercises that use a pulling motion as well as during a lot or work from gripping weights and small movements while doing arm workouts. As for the bodybuilder that has the most complete package in the arm department, I would have to say that would have to be Phil Heath. Great overall mass as well as amazing biceps peaks and great horseshoe in his triceps make for a great upper arm. With his high head while flexing it really makes the forearms really pop as well. Arms, compared to other muscle groups, are fairly small and recover easily. Think of how long it takes for soreness to go away after a leg day compared to an arm day. Because of this, I believe that in order to gain arm size they need to be targeted twice a week with heavy weights. Click Here For A Printable Log Of nucleo's Monday Workout. On this exercise, what you do is pick a weight that is about 10 percent heavier than what you are used to doing. Now, get in the position you normally would when doing concentration curls (i.e. 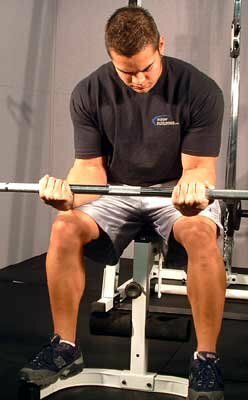 back of the arm on the knee while you are seated and curling the weight up). Help the weight up with your other hand and SLOWLY bring it down. Take about 4-5 secs. These are called negatives. Studies have shown that this form of movement causes micro-tears in the muscle causing it to grow when it recovers. Click Here For A Printable Log Of nucleo's Tuesday Workout. This is a routine Larry Scott prescribed to. I find it extremely effective. Click Here For A Printable Log Of nucleo's Friday Biceps Workout. These are called trisets. You should do 3-4 sets with 6-7 reps. At the end of each exercise do 3-4 burn reps. These are basically half-reps where you really squeeze the muscles and pump them up with blood! Only one more thing left to do ... EFS "extreme fascial stretching." I started including these in my workouts and my arms have started growing! EFS for biceps: Get in the incline dumbbell curl position. Curl the weight up and bring it back down. Feel the stretch and hold it there for about 45 secs. Click Here For A Printable Log Of nucleo's Friday Triceps Workout. EFS for triceps: Get into the 1-arm dumbbell extension position. Bring the weight down behind your head and hold the stretch for 45 secs. That's it! The way the split is designed you will prevent overtraining. Make sure you eat enough protein, carbs and other nutrients. Your muscles will not grow without the nourishment. I do split them up (Monday and Tuesday) and work them on the same day (Friday) as well. This way I can fatigue them and let them recuperate as well. For me aesthetics are more important than arm size. There are many bodybuilders with huge arms that I would not look twice at. But bodybuilders like Larry Scott and Arnold have arms that are aesthetic and big! I could literally stare at them for hours! (OK, maybe not hours, but for a while). That Are Aesthetic And Big! Well, that's it from my side. Happy Growing! Perform this workout once a week. If building huge arms is your priority then make this the first workout you perform each week. Use 40% to 50% of the weight you will use for the actual workout. Remember, just warm-up the muscle and DO NOT pre exhaust. Rest one minute between supersets. Click Here For A Printable Log Of timdh3000's Warm Up. This workout is divided into 5 different rotations. 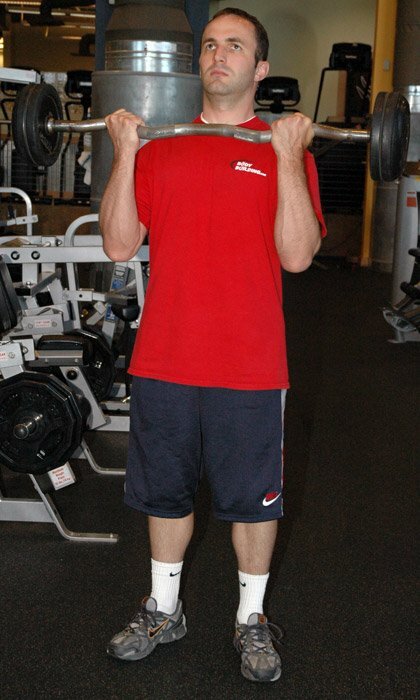 Each rotation consists of a superset using two different arm exercises. Every set should be performed until failure but within the recommended repetition range. Complete each rotation in order before moving onto the next rotation. Take a 2-to-3-minute rest after each superset. The goal here is to develop huge arms. Therefore, a heavy weight and quick tempo was chosen to target the fast-twitch muscle fibers, which have the most potential for muscle growth. *During set 2 perform a drop set. A drop set is similar to performing 3 sets back to back to back. Start with the weight you used for set one and perform 4-to-6 reps. Once you reach failure drop the weight down to a lighter load and perform another 4-to-6 reps. Again, once you reach failure drop the weight down again and perform another 4-to-6 reps. CAUTION: This may hurt a bit. Click Here For A Printable Log Of timdh3000's 5 Rotation Workout. Obviously, I recommend training the entire arm during one session and also once per week. Remember, this workout is the stimulus to make your arm muscles grow and only one part of the huge arm equation. Proper nutrition and rest are the other part. Therefore, taking a week off and eating properly between workouts will allow your arms to grow HUGE! Lee Priest had the most complete package in the arm department and is one of the most underrated bodybuilders of all time.